Croatia with its capital Zagreb is located in Europe (Southeastern Europe, bordering the Adriatic Sea). It covers some 56,595 square kilometers (slightly smaller than West Virginia) with a population of 4,292,100. Croatian and Serbian are the languages spoken by people in Croatia. Bosnia and Herzegovina, Hungary, Montenegro, Serbia and Slovenia are bordering countries. Croatia is a country situated in the Balkans and in Central Europe. Northern Croatia has a temperate continental climate whereas the central and upland regions have a mountainous climate. The entire Adriatic coast has a pleasant Mediterranean climate. Croatia was the first country in Europe to start with the concept of commercial naturist resorts. According to some estimates about 15% of all tourists that visit the country are naturists or nudists (more than one million each year). The terrain is geographically diverse having flat plains along Hungarian border, low mountains and highlands near Adriatic coastline and islands. The average density of population is about 76 per km². The climate in Croatia can be described as Mediterranean and continentalcontinental climate predominant with hot summers and cold winters, mild winters, dry summers along coast. Possible natural disasters include destructive earthquakes. To reach someone Croatia dial +385 prior to a number. The local cellular networks are operated on 900 MHz, 1800 MHz, 3G, 4G. Websites typically end with the top level domain ".hr". If you want to bring electric appliances (e.g. battery chaarger), keep in min the local 230 V - 50 Hz (plugs: C, F). The sign for the locally used currency Kuna is HRK. 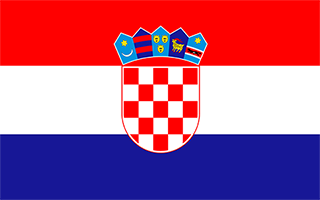 Three equal horizontal bands of red (top), white, and blue - the Pan-Slav colors - superimposed by the Croatian coat of arms; the coat of arms consists of one main shield (a checkerboard of 13 red and 12 silver (white) fields) surmounted by five smaller shields that form a crown over the main shield; the five small shields represent five historic regions (from left to right): Croatia, Dubrovnik, Dalmatia, Istria, and Slavonia.